Let’s talk Hawaii water safety, again. Before we jump into what prompted this post, let’s review some Hawaii water safety recommendations. Never turn your back to the ocean. When you are swimming or simply standing or walking by the shoreline, you never know when a strong wave might sneak up on you. The waves could appear to be predictable for many minutes before a rogue wave hits. If in doubt, don’t go out. If you aren’t sure of the conditions, don’t risk it. Where possible swim at lifeguarded beaches. Avoid swimming at night, dawn and dusk. That’s when sharks tend to be the most aggressive and active. On Oahu, Box jellyfish usually arrive to the near shore approximately 7 to 11 days after the full moon of each month. For Oahu, check this Box jellyfish arrival prediction calendar. I try to wear a flotation device when kayaking, snorkeling, canoeing, etc. At waterfalls, don’t go beyond guard rails. Look upstream towards the mountains and check for rain-like conditions. Flash floods can occur without warning. I experienced a flash flood at Waimoku Falls and it was frightening. In the blink of an eye, the waterflow tripled. We had to cross that stream to hike back to our car. A few other visitors were there at the same time. We all wondered if we’d be trapped until the waterflow subsided. We didn’t know if conditions would get worse. We all looked after each other as we crossed the stream. I prayed and held on to large rocks standing high above the waterline for dear life as I crossed. I thank God I survived! Be aware that rocks below the water’s surface can be invisible and extremely slippery. Resist the urge to dive in. Occasionally rocks are swept in streams and plunge below waterfalls and you don’t want to be under the flow when that happens. Now, what prompted this post? A twitter pal from the San Francisco Bay area alerted me to her local news coverage of the ocean dangers around Hawaii — particularly in Kauai. (The news segments are embedded below. Email subscribers: click this link to view the videos on this post page.) Sadly, 11 people drowned in Kauai this year alone — with three of those victims being from the Bay area. 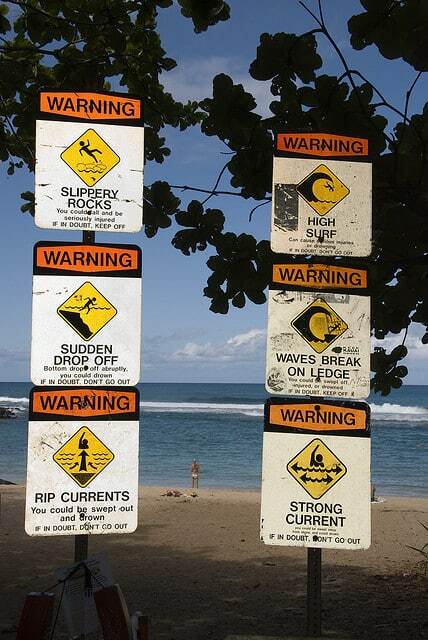 In my opinion, Hawaii does a great job of posting signage about the dangers at each beach. It’s up to the beachgoers to heed the warnings. However, many visitors are easily distracted by the beauty of the ocean. Have you ever had a close call in Hawaii’s waters? 1) Do not struggle against the current. Most riptide deaths are not caused by the tides themselves. People often become exhausted struggling against the current, and cannot make it back to shore. 2) Do not swim toward shore. You will be fighting the current, and you will lose. 3) Swim parallel to shore, across the current. Generally speaking, a riptide is less than 100 ft. wide, so swimming beyond it should not be too difficult. 4) If you cannot swim out of the riptide, float on your back and allow the riptide to take you away from shore until you are beyond the pull of the current. Rip currents generally subside 50 to 100 yards from shore. Once the riptide subsides, swim parallel to shore and then back to shore. Are water sports open in October? As long as the ocean conditions are favorable, there are water sports all year long in Hawaii.